For 30 years, dialysis clinics and their patients have relied on Minntech Renal Systems' quality hemodialysis concentrates. Minntech's full line of products include acetate and bicarbonate formulas in both liquid and powder forms. 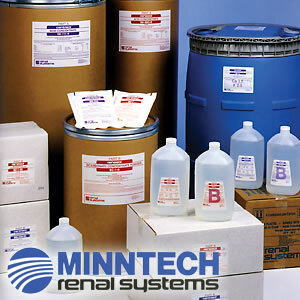 Minntech also offers a wide selection of higher sodium, bicarbonate formulas— ideal for high efficiency and high flux dialysis. All Minntech concentrates meet exacting quality standards and are manufactured with AAMI quality water. For more information or pricing, please contact Dial Medical Customer Service. These formulas are designed to be used with the following three-stream Gambro, B. Braun, Althin, Hospal, Baxter and Fresenius (36.83X dilution) equipment. 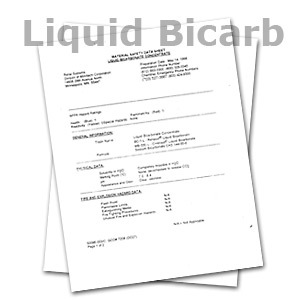 The SB-1000 liquid acid concentrate series is formulated to be mixed in conjunction with Renal Systems BC-1 Series Sodium Bicarbonate Concentrate or equivalent in a compatible 36.83X dilution three-stream artificial kidney (hemodialysis) machine. Refer to instructions provided by artificial kidney machine manufacturer prior to starting dialysis. 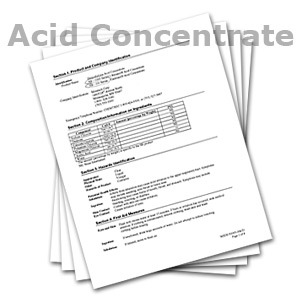 For every 36.83 volume parts of dialysate, mix 1 volume part of acid concentrate (SB-1000 series) and 1.83 volume parts of properly mixed BC-1 Series Sodium Bicarbonate Concentrate with 34 volume parts of purified water (AAMI quality). These formulas are designed to be used with Cobe or properly calibrated Gambro, B. Braun or Fresenius (45X dilution) equipment only. The SB-100 and SB-300 liquid acid concentrate series is formulated to be mixed in conjunction with Minntech's MB-330 Series Sodium Bicarbonate Concentrate or equivalent in a compatible 45X dilution three-stream artificial kidney (hemodialysis) machine. Refer to instructions provided by artificial kidney machine manufacturer prior to starting dialysis. 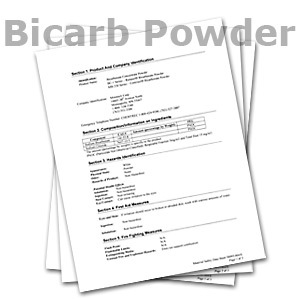 For every 45 volume parts of dialysate, mix 1 volume part of acid concentrate (SB-100 series or SB-300 series) and 1.72 volume parts of properly mixed MB-330 Series Sodium Bicarbonate Concentrate with 42.28 volume parts of purified water (AAMI quality).